It's going down tonight at The Palace Pool Club! BNO 10th Anniversary Party! Let's go! Yeah meeen! What does BNO stand for? BNO stands for "Boys' Night Out"
How to abbreviate "Boys' Night Out"? What is the meaning of BNO abbreviation? 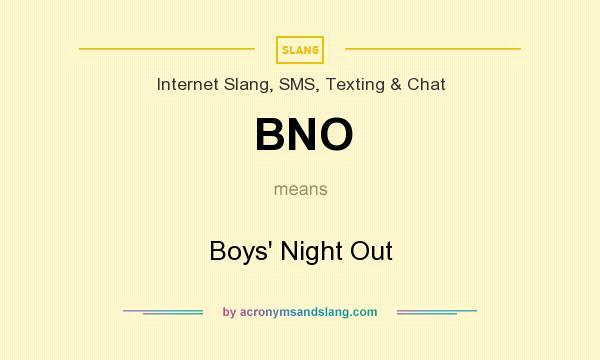 The meaning of BNO abbreviation is "Boys' Night Out"
BNO as abbreviation means "Boys' Night Out"